Selected by a distinguished panel of some of Silicon Valley's elite, the .com 25 honors the remarkable innovators, entrepreneurs and companies whose inspiring contributions were fundamental in shaping the Internet and, thereby, forever changing the way we think and act as individuals and as a society. Sometimes .com companies need bricks and mortar, too. Yahoo! plans to build a 46-acre campus in the heart of Silicon Valley, and the proposal was approved on May 11th by the Santa Clara city council by a unanimous vote. 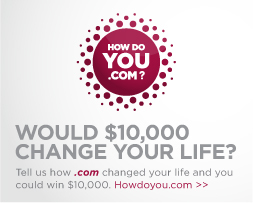 Tell us how .com has changed your life and win one of 10 iPads, $2,500, $5,000, or $10,000. Enter at HowDoYou.com today. 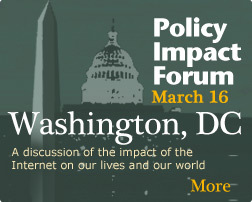 On Tuesday, March 16, VeriSign hosted a Policy Impact Forum headlined by President Bill Clinton, also featuring a keynote address by Dr. Fareed Zakaria. Sign up or connect using your Facebook account details. Please complete your details below so that you can 'Like' the nominees. Update: Grant application deadline extended to November 15th.